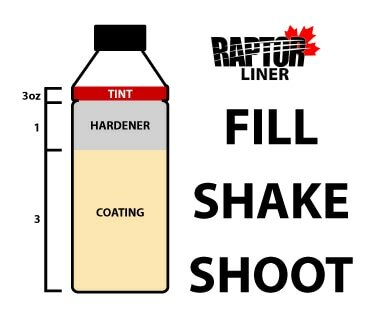 RAPTOR Liner Canada now offers a computerized mixing system that will take your vehicle paint code to mix the Urethane colour to make the 1st bottle of RAPTOR exactly the same as the last one. It is also a great way to re-order your paint colour if you decide to do touch ups or more of your project in that same specific colour. Below is a table that shows where your paint code may be hiding on your vehicle. Just take a photo of it and send it in to us with your order so we can get it mixed. We computerize the mixing and give you 1 bottle of Urethane Tint for every bottle of Tintable RAPTOR ordered. All you have to do is add our supplied hardener up to the line on the bottle, pour the tint colour in, shake for 2 minutes and shoot. It's that easy! *** When mixing 10% colour tint (100ml) into a 750ml bottle of tintable Raptor, colour matching will never be exact due to the volume of Raptor and it's ability to saturate the tintable Raptor. Most of the time, the colour should be very close.